Health-related quality of life (HRQOL) is a multidimensional concept including well-being in terms of patient's physical, emotional, mental, and social behaviors and is defined as the way the effects of a disease and/or its treatment are perceived by the patient. The assessment of HRQOL in clinical practice is important to evaluate the course of the disease, early detection of problems, and to determine what type of therapy would be adequate to maintain acceptable metabolic control with less impact on HRQOL in each patient. HRQOL has increasingly been acknowledged as an essential health outcome measure in pediatric medicine. The development and use of pediatric HRQOL measures are important for identifying at-risk children and applying early intervention programs. Type 1 diabetes mellitus (T1DM) is one of the most common chronic childhood illnesses, affecting approximately 1 in every 400–600 children and adolescents. It affects all aspects of a patient's life, especially psychologically. Its management is complex, requiring a high degree of responsibility and self-control to achieve an adequate metabolic control. Key aspects to succeed are the support of a multidisciplinary team, education in disease management with decision-making capacity, the possibilities offered by new technologies and the emotional sphere of the patient and family. In fact, treatment guidelines recommend routine screening for emotional status and family relationships, mainly during puberty characterized by hormonal and psychosocial changes. Until recently, all HRQOL research in patients with diabetes had been conducted mostly in North America, Australia, and the UK. No study from the Maghreb in region has been reported. Since there is a great difference in the health-care delivery system, religion, culture, and family dynamics in different societies, there is a need to do HRQOL studies in different communities. The aim of our study is to assess the reliability and accomplish a limited validation of the diabetes-specific quality of life (QOL) instrument KINDL-R diabetes module (DM) to the population of Tunisian and Arabic diabetic children. In addition, a second purpose was to understand the relationship between the QOL in youths with type 1 diabetes and its associated clinical and sociodemographic factors. The study has received the approval of the Ethical Committee on October 1, 2014. A total of 108 children and adolescents, aged 3–17 years, diagnosed with type 1 diabetes for at least 6 months and their parents referring to our diabetes Center's, in Children's Hospital Bechir Hamza of Tunisia, pediatric emergency department and external consultation, were enrolled in the study, between January 2016 and June 2016. All the parents and children aged more than 6 years have given their informed consent. For children under 6 years, we only had their parents' informed consent. Exclusion criteria were <6 months from diagnosis of T1DM, cognitive problems that prevented comprehension of the questionnaires, and patients who declined to participate in the study. After agreeing to participate in the study, parents and child filled in the KINDL-R DM questionnaire of QOL. We used a questionnaire that was originally designed in German (originally developed by Bullinger et al. 1994 revised by Ravens-Sieberer and Bullinger in 1998,) for use in clinical populations but also with healthy children and adolescents. Three versions of the KINDL-R DM questionnaire are available as self-report measures for different age groups: KIDDY KINDL (3–6 years) (n = 19), KID KINDL (7–13 years) (n = 62), and KIDDO KINDL (13–17 years). In addition, the questionnaire is available in two proxy versions for parents (3–6-year-old and 7–17-year-old). The KINDL-R DM of QOL consisted of 24 items divided into six subscales including physical well-being, emotional well-being, self-esteem, family, friends, and everyday functioning (school or nursery school/kindergarten). The questionnaires took approximately 15 min to be completed. Likert response scale with four categories was used, ranging from never a problem (0) to usually a problem (4). All the subscales can be combined to produce a total score (0–100 score). Higher scores represented better QOL. One of the authors was responsible for completing the questionnaire for children by face-to-face interview, and she was available to clarify the possible questions of the parents about the instrument. We obtained permission to translate the KINDL-R DM of QOL in literary and dialectal Arabic. This was performed by the Tunisian National Translation Center and was approved by a third translator and two pediatricians. A pretest was administrated to a sample of patients and their parents to verify that the items are understandable. The reliability of the QOL subscales was tested using the Cronbach's alpha coefficient. An internal consistency of 0.70 was set for measures used to detect differences between groups and >0.90 for interpreting individual scores. Construct validity was examined through an analysis of the intercorrelations among KINDL-R total score and KINDL-R scale scores. Concurrent validity was assessed by calculating the intercorrelations between children's and parents' responds. The exploratory factor analysis with varimax rotation was used to determine the construct validity of the KINDL-R. Convergent and discriminant validity was checked using Spearman correlation. The value of a correlation coefficient of >0.40 between an item and its own scale is regarded as an adequate evidence of convergent validity. Statistical analysis was performed with SPSS 12.0 for Windows (SPSS Inc., Chicago Ill.). To assess any relationship between diabetes-related QOL and sociodemographic factors, body mass index (BMI), metabolic control (HbA1c), type of family, age at onset and duration of diabetes, type of insulin regimen and educational level of the parents, the Pearson correlation coefficient was used. Unpaired t-tests were used for comparisons between the scores. One-way ANOVA was used for comparisons between different age groups. For all analyses, P ≤ 0.05 was considered to provide statistical significance. Patient's demographic- and diabetes-specific data are presented in [Table 1] and [Table 2]. The average age of participants was 11.02 years; 50% were girls; 4.8% came from single-parent families; and 29.8% of parents had a university degree. The mean time of disease progression was 4.4 years, with 30.77% (n = 32) longstanding (>5 years), and 18.26% <1 year. 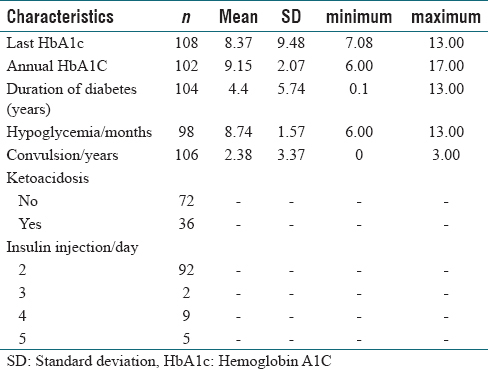 The mean annual HbA1c level was 9.15% (SD ± 2.07); 26.53% of patients had good metabolic control (HbA1c <7%); 92 (85.18%) were taking two injections of insulin per day, 16 (14.81%) 3–4 injections, and no patient used an insulin pump. Although HbA1c values tended to increase, as children grew older, we could not find a statistically significant difference between the different age groups and between the genders (P ≤ 0.01). Cronbach's alpha coefficient for all subscales and total scores of both patient and parent reports of the Arabic and dialectal versions of KINDL-R DM approached or exceeded the reliability standard of 0.70, which is considered satisfactory. It was equally high for all age groups and subscales (0.69–0.77). Patient and parent reports had an adequate level of concordance, with coefficient values of at least 0.684 [Table 3]. 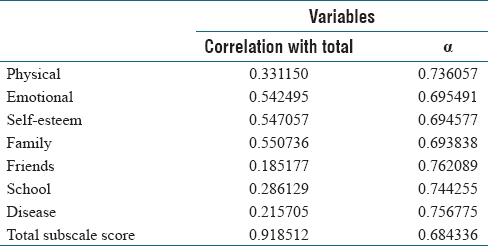 In [Table 4], underlined values represent correlations between child and parent proxy reports. Parents showed an adequate level of concordance with their children and most of the correlation coefficients reached or exceeded 0.50. All of the above are statistically significant using Pearson correlation coefficient (P < 0.01). No significant correlation was found between the total or all subscales score of the diabetic children and gender, BMI, HbA1c, type of family, age at onset and duration of diabetes, insulin therapy and residence. [Figure 1] and [Figure 2] show the mean and range of item scores of the child and parent proxy Arabic KINDL-R DM. Paired-samples t-test revealed that there was a statistically significant difference between the generic HRQOL of children and adolescents with diabetes as reported by themselves and their parents as shown in [Table 5]. We did not find any differences in HRQOL reports among different age and gender groups. 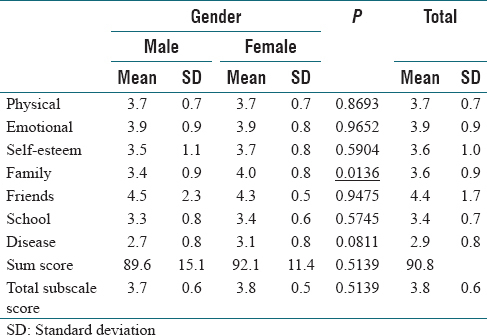 [Table 6] demonstrates the comparison between HRQOL reports of male and female based on the KINDL-R DM responds. HRQOL total and all subscales scores were regressed on gender, age, number of hypoglycemic episodes, environment, parent's instruction level's, socioeconomic condition, and HbA1c [Table 7]. The emotional score was correlated to the environment (P = 0.03). The physical score was related to father's instruction levels (P = 0.04). 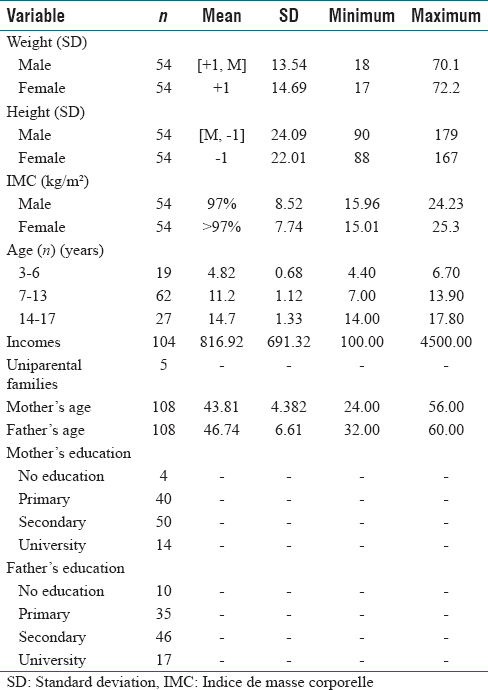 Self-esteem was reported to environment (P = 0.02) and mother's instruction level's (P = 0.014). Gender, large BMI, poor metabolic control, school level, and intensity of the treatment did not influence QOL of children with diabetes [Table 6] and [Table 7]. There has been an increasing need among clinicians for disease-specific QOL scales in recent years. While information about HRQoL is extremely important to the clinical practice of all clinicians, a diabetes-related QoL instrument was not available in Tunisia. This study indicates that the literary and dialectal Arabic version of the KINDL-R DM is a reliable instrument in Tunisian children with type 1 diabetes, with excellent convergent and good discriminant validity. Cultural adaptation of this instrument in the diabetic population of Tunisian children was completed by the evaluation of their psychometric properties. The KINDL-R DM child and parent proxy-report internal consistency reliabilities generally reached the recommended minimum coefficient standard of 0.70 for group comparisons. As Cronbach's internal consistency coefficients represent the lower limit of the actual reliability of a measurement instrument, and a conservative estimate of actual reliability, it is concluded that Arabic and dialectal versions of the KINDL–R DM are reliable and can be used for the measurement of the QOL of youths with diabetes and for the conduction of a comparative study with non-diabetic youths in Northern Africa and Arab countries. However, it should be noted that the relatively small sample sizes possibly precluded better reliability estimates for this instrument. To additionally extend reliability and validation estimates, the KINDL-R DM could be tested with different types of methods such as test-retest. In comparison with Greek,, American, Dutch, and Iranian children, Tunisian children with type 1 diabetes reported lower HRQOL total and all subscales scores, according to self- and proxy-reports using the KINDL-R DM questionnaire. It may be attributed to different cultures and languages. In fact, Ethnic disparities are important in determining the prevalence, care, treatment outcomes, and QOL of diabetics as shown by many international studies including the San Antonio Heart Study. The parents in our study reported that their children had lower diabetes-specific HRQOL than the children themselves. The discrepancy between patient and parent reports is consistent with previous findings.,, It is possible that this result reflects that the parents have identified themselves with the child's diabetes. In addition to this, this may indicate the burden of diabetes on the parent, which could affect family communication and lead to parental over-involvement. Furthermore, parents may be more likely to take into consideration that their child might be restricted by their diabetes. In terms of age differences, the present study showed that adolescents (between 13 and 17 years), reported the lower diabetes-specific HRQOL than younger children. These findings have been reported in earlier studies. This may indicate an enhanced experience of being different from their peers because these children are living with a chronic disease. This result might also reveal that a chronic disease management might interfere and complicate the process of separation and development toward maturity. According to the present study, the analysis revealed that the urban environment predicts better total and emotional score mainly children's self-esteem. In addition, socioeconomic condition such as parent's level instruction was predictive factor of better physical score and self-esteem. In fact, other studies had already linked a worse HRQOL in children with specific characteristics such as those from families with disadvantaged socioeconomic status., The results of the present study reinforce this finding and the importance of knowing the social situation of the patient. Evidence shows that better HRQOL is associated with better metabolic control although this relationship is modest, in many studies., In our study, it is not possible to establish the directionality of association between HRQOL and HbA1c. Furthermore, gender, large BMI, poor metabolic control, school level, and intensity of treatment was not a predictor of HRQOL of children with diabetes. This study has a number of potential limitations, which may minimally affect the power of its results. First, it had not included a control group similar in age and gender distribution to the study group, to compare them to diabetic children. 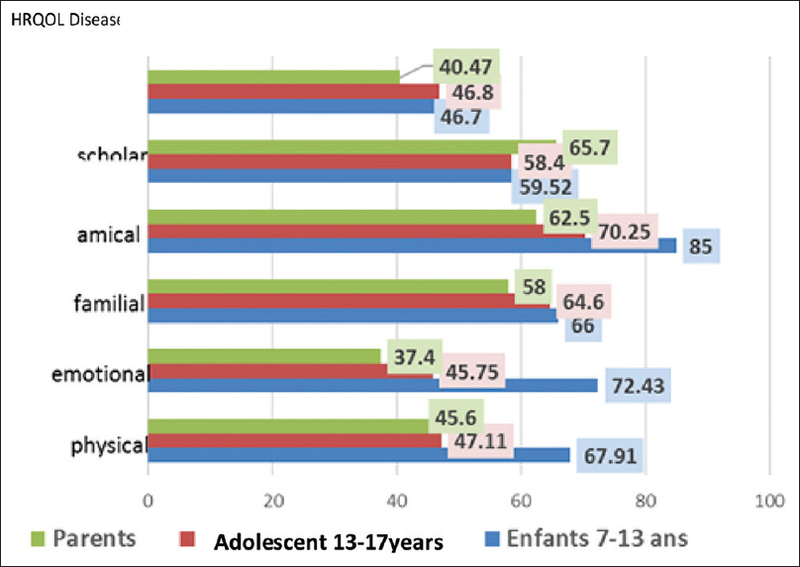 Further Tunisian studies are required in the generic HRQOL-field comparing children and adolescents with T1DM and healthy children, or among children in different clinical groups concerning their chronic conditions. Second, all patients were recruited from a single pediatric hospital; thus, caution is necessary when generalizing the findings to children and adolescents being managed in other settings. A larger study is also needed to further investigate the possible correlations between the predictive factors of HRQOL in diabetic children. This study showed that the literary and dialectal Arabic version of the KINDL-R DM of QOL have sufficient acceptability, reliability, and validity so as to be used for the purposes of a comparative in Tunisian and Arabic populations. Moreover, lower HRQOL in Tunisian children with diabetes indicates that youth with diabetes in Tunisia require intensive programs to increase their HRQOL, and more supportive resources should be allocated. In fact, we recommend that assessment of HRQOL after diagnosis of T1DM should be a routine practice in patients with diabetes to facilitate communication, identify early problems, and implement the early intervention. This study was funded by Global Pediatric Endocrinology and Diabetes (GPED, www.globalpedendo.org). Caferoğlu Z, İnanç N, Hatipoğlu N, Kurtoğlu S. Health-related quality of life and metabolic control in children and adolescents with type 1 diabetes mellitus. J Clin Res Pediatr Endocrinol 2016;8:67-73. Abdul-Rasoul M, AlOtaibi F, Abdulla A, Rahme Z, AlShawaf F. Quality of life of children and adolescents with type 1 diabetes in Kuwait. Med Princ Pract 2013;22:379-84.
de Wit M, Delemarre-van de Waal HA, Bokma JA, Haasnoot K, Houdijk MC, Gemke RJ, et al. Monitoring and discussing health-related quality of life in adolescents with type 1 diabetes improve psychosocial well-being: A randomized controlled trial. Diabetes Care 2008;31:1521-6. Kalyva E, Malakonaki E, Eiser C, Mamoulakis D. Health-related quality of life (HRQoL) of children with type 1 diabetes mellitus (T1DM): Self and parental perceptions. Pediatr Diabetes 2011;12:34-40. Murillo M, Bel J, Pérez J, Corripio R, Carreras G, Herrero X, et al. Health-related quality of life (HRQOL) and its associated factors in children with type 1 diabetes mellitus (T1DM). BMC Pediatr 2017;17:16. Delamater AM, de Wit M, McDarby V, Malik J, Acerini CL. ISPAD clinical practice consensus guidelines 2014 compendium. Psychological care of children and adolescents with type 1 diabetes. Pediatr Diabetes 2014;15 Suppl 20:232-44. Varni JW, Burwinkle TM, Jacobs JR, Gottschalk M, Kaufman F, Jones KL, et al. The pedsQL in type 1 and type 2 diabetes: Reliability and validity of the pediatric quality of life inventory generic core scales and type 1 diabetes module. Diabetes Care 2003;26:631-7. Ravens-Sieberer U, Bullinger M. Assessing health-related quality of life in chronically ill children with the German KINDL:First psychometric and content analytical results. Qual Life Res 1998;7:399-407. Yildirim A, Akinci F, Gozu H, Sargin H, Orbay E, Sargin M. Translation, cultural adaptation, cross-validation of the Turkish diabetes quality-of-life (DQOL) measure. Qual Life Res 2007;16:873-9. Sand P, Kljajić M, Schaller J, Forsander G. The reliability of the health related quality of life questionnaire PedsQL 3.0 diabetes module™ for Swedish children with type 1 diabetes. Acta Paediatr 2012;101:e344-9. Gkoltsiou K, Dimitrakaki C, Tzavara C, Papaevangelou V, Varni JW, Tountas Y. Measuring health-related quality of life in Greek children: Psychometric properties of the Greek version of the pediatric quality of life inventory (TM) 4.0 generic core scales. Qual Life Res 2008;17:299-305. Emmanouilidou E, Galli-Tsinopoulou A, Karavatos A, Nousia-Arvanitakis S. Quality of life of children and adolescents with diabetes of Northern Greek origin. Hippokratia 2008;12:168-75. Varni JW, Limbers CA, Burwinkle TM, Bryant WP, Wilson DP. The ePedsQL in type 1 and type 2 diabetes: Feasibility, reliability, and validity of the pediatric quality of life inventory internet administration. Diabetes Care 2008;31:672-7. Jafari P, Forouzandeh E, Bagheri Z, Karamizadeh Z, Shalileh K. Health related quality of life of Iranian children with type 1 diabetes: Reliability and validity of the Persian version of the PedsQL™ generic core scales and diabetes module. Health Qual Life Outcomes 2011;9:104. Nuboer R, Borsboom GJ, Zoethout JA, Koot HM, Bruining J. Effects of insulin pump vs. injection treatment on quality of life and impact of disease in children with type 1 diabetes mellitus in a randomized, prospective comparison. Pediatr Diabetes 2008;9:291-6. Goh SG, Rusli BN, Khalid BA. 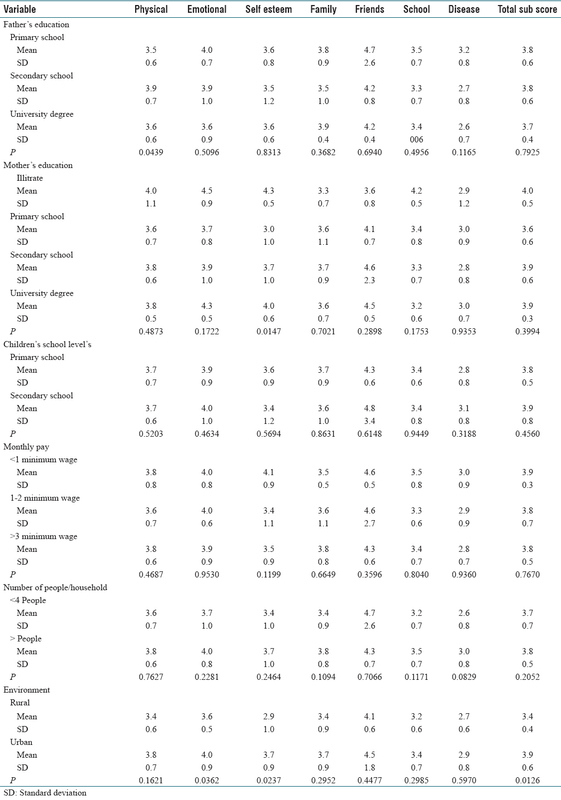 Development and validation of the Asian diabetes quality of life (AsianDQOL) questionnaire. Diabetes Res Clin Pract 2015;108:489-98. Nardi L, Zucchini S, D'Alberton F, Salardi S, Maltoni G, Bisacchi N, et al. Quality of life, psychological adjustment and metabolic control in youths with type 1 diabetes: A study with self- and parent-report questionnaires. Pediatr Diabetes 2008;9:496-503. Anderson BJ, McKay SV. Barriers to glycemic control in youth with type 1 diabetes and type 2 diabetes. Pediatr Diabetes 2011;12:197-205. Silverstein J, Cheng P, Ruedy KJ, Kollman C, Beck RW, Klingensmith GJ, et al. Depressive symptoms in youth with type 1 or type 2 diabetes: Results of the pediatric diabetes consortium screening assessment of depression in diabetes study. Diabetes Care 2015;38:2341-3. Hilliard ME, Mann KA, Peugh JL, Hood KK. How poorer quality of life in adolescence predicts subsequent type 1 diabetes management and control. Patient Educ Couns 2013;91:120-5.